Our custom built Shopr plugin allows you to curate shoppable widgets and wardrobe features in seconds, regardless of what links you want to use. 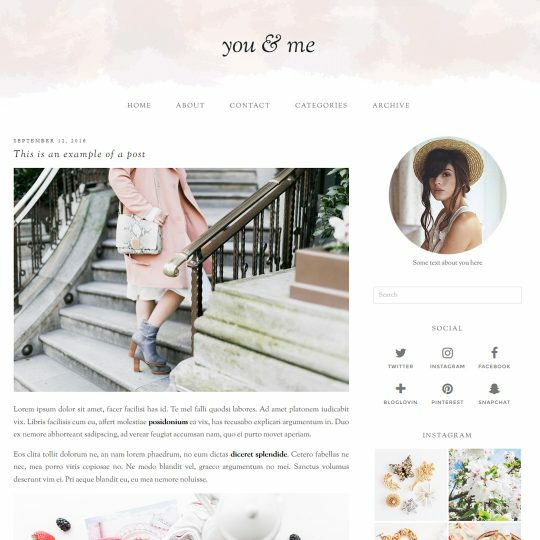 So, whether you use affiliate links or not, you can insert any links into the Shopr plugin, select your image and you can generate a shoppable carousel to place anywhere you want on your site. Shopr is designed to make your life easier when it comes to sharing products with your readers. We’ve made it simple and straightforward – without having to sign up to any 3rd party affiliate schemes – to ensure your content has the latest options without costing you extra time. Absolutely LOVE this plugin. Offers easy set-up, streamlines the process of uploading photos, and highly customizable. If you’ve already purchased a theme, this add-on is a must! Super easy to add products and can easily be added to any position on your website. A fantastic plugin to have! I really love this plugin. I am not very tech savvy and this plugin is so user friendly! Plus it lets me display products in a beautiful format that matches my theme so well. I can’t say enough good things about Pipdig and Phil. Amazing products and amazing customer service!! I love this plugin and find it really easy to use with both affiliate links and no affiliate links. It easy to put into post and on your front page. This is so amazing. I love how slick and professional this has made my blog posts look; especially as it fits nicely across the screen. It’s easy to use and you can add as many products from different sources too. I’ve noticed an increase in clicks which was something I was struggling with prior. I only have a VERY SLIGHT annoyance (though it could be that I just haven’t worked out how to do this yet) is on the “shop the post widgets”. I wish there was an option to make the products automatically display in random as opposed to how I’ve entered/selected items. Aside from that I only wish I had purchased this sooner. Thanks guys, keep up the amazing work. I love this plugin. It’s very elegant and classy, and not overly salesy. Love, love, love the Shopr plugin! So easy to use and I am discovering new ways to utilize it all the time! It’s making such a difference to my affiliate sales and was well worth the investment! My affiliate revenue has increased because it’s so easy to display my favourite products in a professional way, on my posts and on my Shop page. Thank you pipdig! Love this plugin. Its really easy to install and use. It has taken my website to another level and I’m so happy I purchased this. You will not be disappointed if you decide to use this. I really love this plugin, it makes the products I add look amazing and it makes affiliate links a breeze. I am so happy I bought this, it compliments my site design well and is really easy to use. There is a lot of guidance for anything you want to know, with written instructions and even video tutorials. This plug in is so helpful and does exactly what I was looking for. It’s easy to use once you understand how it works. Definitely worth the purchase. So good. Love this plugin. It makes getting all my affiliate stuff up quick and easy, plus the plugin is so versatile and looks great everywhere! Plugin looks great! Love that it can also be used to create a shop of all our linked products. Ultra pratique est très facile d’utilisation, fait gagner beaucoup de temps pour de supers présentations! I love the shopr plugin. It was really improved our click through rate on our affiliate links. And by improved I mean blown it away. Easy to use and install, it looks slick and professional. It has increased my affiliate clicks. Good support. Recent updates have made it appear even better on the page. Such an innovative + intelligent plug in! Very impressed at the level you are able to customise it. And works within blog posts too! So many possibilities and, as always, amazing customer service from pipdig. I love, love, LOVE this plugin! It’s such a beautiful way to display my Amazon affiliate items, and I can add them anywhere on my blog. I also have the option of having an attractive “shop” page that I used to have to fake with my gallery widget. Combine that with easy to follow instructions and fabulous customer service, you can’t go wrong with Phil and Pipdig. I’d give 20 stars, if I could! I love it! OnceI got the hang of it I was able to make my dream shop. Super easy to use, great price, and top notch customer service. Thank you! Very easy to set up and use. Love that I can show where to buy all the products in my posts. Love it! It is super easy to use and serves its purpose perfectly. I use it with Amazon links and works great! Fabulous! Just what I wanted to display the products in my Etsy store. Very easy to use and Pipdig are quick to respond to any questions. I’ve loved my Pipdig theme since the day I got it, and now this Shopr plugin makes it even better! If you’re hestitating at all over buying it, just do it – you’ll love it! So so easy to use and install, as usual Phil from Pipdig comes up with simply the best shopping widgets, get it while its half price! Love this plugin! I wanted an easy way to display products in my shop page nd this was the perfect solution. It’s easy to setup and Phil at Pipdig helped me with any questions I had. Thank you! Install the plugin and start products in a matter of minutes. Add/remove products directly from your WordPress dashboard. Choose the number of columns to show in your shop and pick from unlimited colors/fonts. Display products on your site from any source, including affiliate links. Create interactive sliders/carousels of products within your posts. Showcase the products you love and make money from affiliate links. Features adapt perfectly to any desktop or mobile device. Unlike external services such as Shopstyle, product data is added directly to your content. Our custom build “Shop the post” widget can be displayed within any blog post, page or widget area. Easily add products to any post right from your WordPress dashboard. There’s no need to edit any HTML or code! Click here for some examples. Geek tip! Unlike other widget providers, the images are “lazy loaded” into place. This means you can add as many widgets as you like without slowing down your site. Easily create a main “Shop” page to display your favorite products. You can also customize the look and feel of the page via the Customizer. Again, there’s no HTML or coding required! You can also display shopping grids within any post/page to create a “boutique” style wishlist. Tired of uploading an image for each product manually? With the Shopr plugin you don’t have to! Simply click the “Search link for images” button, and Shopr will automatically find the best images for you. You can even pick your favorite from a selection. Easy! We’ve created a range of options for each product, too. From adding titles and subtitles, uploading your own image or letting Shopr pull the image in for you (a huge time and space saver! ), to adding items to different collections – you’ll be able to use the Shopr plugin exactly how you want. “Shopr” is a WordPress plugin which allows you to create shopping features across your site. It’s super easy get started, and can be used to create features such as a main shop page or “Shop the post” widgets. You can view a preview of the features in action by clicking here. If you want to link to products in a blog post, on a page or anywhere on a WordPress site, Shopr is for you. Where can I add products from? You can display products from any website (unless they forbid you doing so). Can I use affiliate links? Yes you can! You can also mix products from any source, allowing you to display affiliate links from multiple vendors such as rewardStyle, Shopstyle and Amazon Affiliates etc. You can also add links from any source, so you’re not limited to the products available on one particular network. How many products can I display? There is no limit to the amount of products you can display. You can also display products in groups called Collections. If you’re using WooCommerce, you can link to your products just the same as external links. You can also link to products from shopping site such as Etsy, Shopify and Ecwid etc. Please note that the Shopr plugin does not add a shopping cart to your website. Instead it is designed to link to products on external sites or as part of your WooCommerce setup. Does the plugin come with support? The plugin comes with extensive step by step guidance on creating each shop feature. We also provide free support for fixing any bugs and making sure it will be compatible with the latest version of WordPress. The Shopr plugin also comes with lifetime automatic updates at no extra cost. The Shopr plugin comes with lifetime automatic updates at no extra cost. Does Shopr work on mobile? The plugin will work with 99% of themes right out of the box. However if you experience any issues you are welcome to contact us. Shopr is fully compatible with all pipdig themes (as you might expect). Can I create a “Shop” page? Yes you can! It is possible to display a shop page with different groups of products, or a single group of products. See this guide for more information. Can I add products to blog posts? Yes you can! It is possible to display a grid of products (much like the shop page shown here) or a carousel of products. See this guide for more information. Can I create a “Shop the look” widget? Yes you can! The Shopr plugin includes a widget which can be displayed within any post/page or widget section of your theme. See this guide for more information. Is the Shopr plugin GDPR compliant? Yes, the Shopr plugin is fully compliant with GDPR. Do I need to edit any HTML/code? Nope! You can add products just the same as adding a blog post. Do I need an account with rewardStyle, Shopstyle, Liketoknow.it, Amazon etc? If you want to display products from those specific services then you would need an account. You can also add links from any source, so you’re not limited to the products available on one particular network. Are links set as nofollow? Yes, all links for products are set as “nofollow” as default to comply with Google guidelines and retain any link SEO within your site content. How many sites can I install the Shopr plugin on? The license key you receive will allow you to install the Shopr plugin on a single site. If you would like to purchase additional licenses for multiple sites, please contact us.